Pen, Paper and Bombay. : The one you cannot have: A Book-Launch to remember. 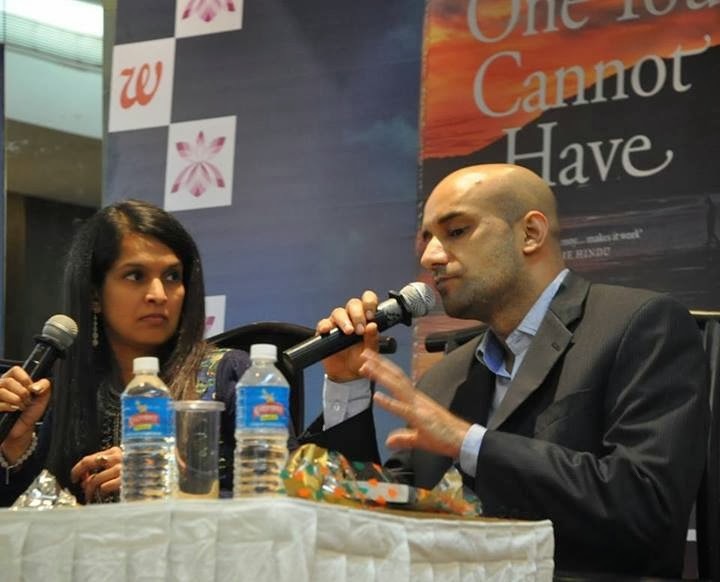 The one you cannot have: A Book-Launch to remember. It was 6th of December and the weekend traffic did not stop her readers from turning up for the grand book launch of “The one you cannot have”. “I’ll be late. I don’t want to miss a thing.” I repeated a zillionth time as the clock struck 6:40 I along with a friend rushed towards the location. “Hotel Royal Orchid.” It was nothing but grand, the location and the arrangement. I sighed in relief when I realized that the event was yet to start. “Just in time” I thought, as all heads turned towards the star of the evening, our very own ‘Preeti Shenoy.’ Clad in an elegant blue attire, with a bunch of flowers in her hand and a generous smile on her face, she walked towards the dais. She was accompanied by Dr.Shyam Bhat, a renowned psychiatrist and integrative medicine expert and Ms. Vani Mahesh, founder of Easylib. What followed was a light hearted session where Preeti talked about the efforts she had put into writing this book. An unrequited love story at the crux, on being asked by Ms.Vani Mahesh that what inspired her to write this book, Preeti said that the large influx of mails on heartbreak compelled her to take this up as the subject of her book. The story has been narrated from three different point of views. After having written four books from a female protagonists point of view, how difficult was it to write 60% of the book from Aman's point of view? Dr. Shyam Bhat and Preeti Shenoy in a conversation about the book. “I would write something and then call up Satish. I would ask him if this is the way guys think? I also discussed the same with some of my male friends and now I can proudly say that I do understand Men. If he comes back home and watches a football match and doesn’t talk to you, it doesn’t mean that he doesn’t love you. He just doesn’t want to be disturbed. Leave him alone and let him watch the match.” She laughed, and then came a another round of applause from every man present in the room. I’ve always believed that she stands apart from the crowd because she never lets go of the Indian touch in her works. Admiring her breezy and easy writing style, Ms. Vani Mahesh said that it is such an easy and interesting read and one doesn’t need to look up for meanings in the dictionary. “The one you cannot have" the title draws the attention of every individual who has ever loved and lost. It strikes a chord with every person who has experienced the pangs of unrequited love. No wonder there were twenty thousand pre-orders. “I was overwhelmed to know that my book opened at number two in the Neilsen Bookscan list” our delighted author said. The floor then opened for discussions and we saw an array of questions. It was then that I realised that her readers range from teenagers to middle aged. “Bangalore is the garden city of India, but it will soon turn into Preeti’s city” an overwhelmed reader from Manipur commented. This was just a start. The questions, compliments and gratitude that the readers showered on her was an absolute delight to witness. 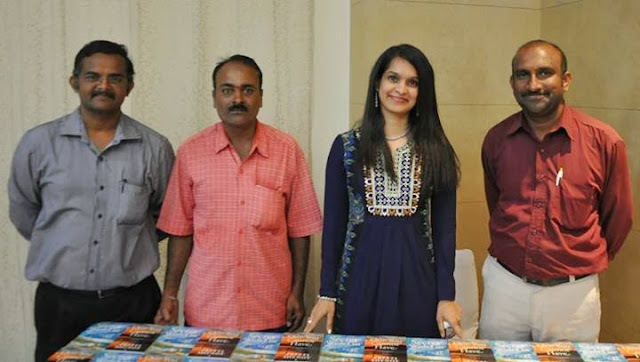 Preeti Shenoy with the Westland team and her books "The one you cannot have" and "The secret wish list"
Even though she has been listed as one amongst the top 100 in the Forbes hundred most influential celebrities list, her humility and generosity makes her readers love her more. And so we saw, how her book helped some to get through bad times and inspired some to write. She gave out some quick tips to the aspiring writers and emphasised on the importance of word-limit. Also, she asked aspiring writers to take criticism positively and not to let venomous criticism affect them. A curious reader asked if she would like to write scripts in near future. “Definitely” with a typical Preeti Shenoy smile, she replied. Here is a good news for all her readers. She has already started working on her next. It didn’t end there. The westland book stall was brimming with readers who would not let go off an opportunity to get an author signed copy. The books were sold out within no time. She clicked pictures with all her readers and then as she signed the books, she didn’t fail to thank her readers personally. 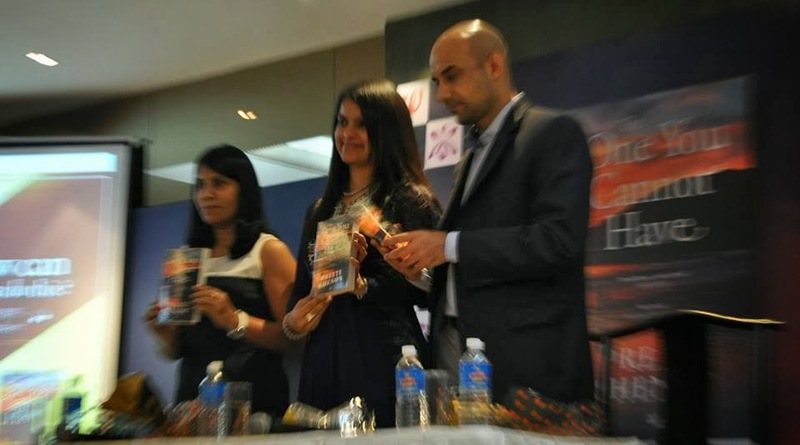 “Thank you so much for coming.” She smiled.“With love, Preeti Shenoy” the second page of the just signed books read. Pertaining to my curfew timing, I could not enjoy the exotic Haiti that was set up for her readers. But I did enjoy something even more exotic. Her book. On my way back home, I flicked through the pages of the book and I could just not put it down. ‘You can't put it down’ Ms. Mahesh had said and now I realize the validity of that statement, as I read the 173rd page of the book. Twenty thousand pre-order copies, number two on the Neilsen’s Book Scan list, one of the most prominent writers of recent times, millions of readers, and yet an ever so generous and humble Preeti Shenoy! We wish her all the best for her latest masterpiece "The one you cannot have". Lucky you, I hope she comes here pretty soon.